This post is kindly brought to you by Safe & Chic, who compensated me for this sponsored post. All product picks, tips and opinions are my own! With an impressive array of coveted clean beauty brands, Safe & Chic is one of the latest online green beauty boutiques to launch this year. Offering more than 35 brands — like 100% Pure, Dr. Alkaitis, EmerginC, Indie Lee, Kahina Giving Beauty, Vapour Beauty and W3ll People — Safe & Chic gives beauty enthusiasts an amazing number of choices when it comes to stocking their vanities with only the best in green beauty. Founder Angela Dubia’s green beauty journey is similar to ones we’ve witnessed before in this community. She established Safe & Chic after having a difficult time finding holistic cosmetics following personal health issues. Safe & Chic is built on the premise of having it all — luxurious, chic beauty products that are better for your body. Besides building the brand around cleaner cosmetics and personal care, Angela opts to donate $1 per item sold to the Breast Cancer Fund. In addition to giving back to the Breast Cancer Fund, Safe & Chic is now a proud member of the Campaign for Safe Cosmetics, another beloved organization that helps people understand more about what’s in their beauty products. Aligned with her mission to educate beauties about the potential harmful effects of their everyday cosmetics, Safe & Chic is coming on to the green beauty scene with great information to help new-to-green shoppers feel good about how they pamper themselves. Use code “kimberlyloc15” at checkout to save, and have fun snatching up some old favorites and new loves at Safe & Chic. 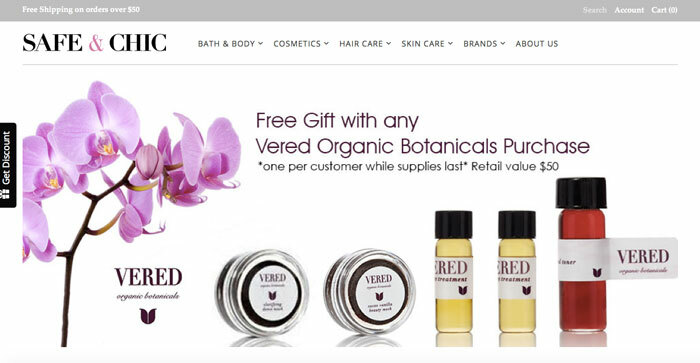 Where are you shopping for green beauty goodies online? Have you heard of Safe & Chic? What brands are hard to find in online boutiques? Tell me in the comments section!